Struggling Hartlepool United earned a draw with Mansfield Town in a fiery clash which saw three dismissals. Junior Brown fired the hosts ahead early on but the Pools levelled through Michael Duckworth's close-range strike. Ryan Tafazolli later picked up a second yellow for Mansfield before Hartlepool's Marlon Harewood saw red after clashing with Jamie McGuire. The visitors held on despite being reduced to nine men when Michael Woods also clashed with McGuire late on. "It was a mad game today. It was also a gage performance wise of where we are, and that we go from doing some really good things to doing some really bad things in the space of 90 minutes. "We are where we are in the league because the level of consistency is not of a team that can put a run of results together, and that is where we need to change things. "You look for people to settle down and drive you forward on the pitch, and in certain areas we are lacking that, but the boys are doing the best they can and I think that will come with confidence." Match ends, Mansfield Town 1, Hartlepool United 1. Second Half ends, Mansfield Town 1, Hartlepool United 1. 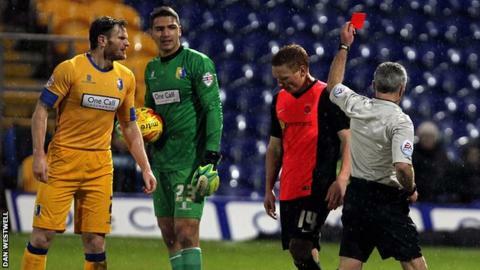 Luke Waterfall (Mansfield Town) is shown the yellow card. Second yellow card to Michael Woods (Hartlepool United). Attempt missed. Dan Jones (Hartlepool United) left footed shot from the centre of the box is too high. Attempt saved. Vadaine Oliver (Mansfield Town) right footed shot from the right side of the box is saved in the centre of the goal. Attempt missed. Rakish Bingham (Mansfield Town) right footed shot from the right side of the box misses to the right. Attempt saved. Rakish Bingham (Mansfield Town) header from the centre of the box is saved in the centre of the goal. Marlon Harewood (Hartlepool United) is shown the red card for a bad foul. Attempt missed. Jonathan Franks (Hartlepool United) right footed shot from the left side of the box misses to the left. Michael Duckworth (Hartlepool United) is shown the yellow card. Attempt missed. Rakish Bingham (Mansfield Town) right footed shot from the right side of the box is close, but misses to the left. Attempt missed. Jonathan Franks (Hartlepool United) left footed shot from the left side of the box misses to the left. Luke Waterfall (Mansfield Town) wins a free kick on the right wing. Substitution, Mansfield Town. Rakish Bingham replaces Matthew Rhead. Substitution, Hartlepool United. Scott Fenwick replaces Joe Ironside. Attempt saved. Dan Jones (Hartlepool United) right footed shot from the centre of the box is saved in the centre of the goal. Substitution, Mansfield Town. Martin Riley replaces Reggie Lambe. Corner, Hartlepool United. Conceded by Luke Waterfall. Ritchie Sutton (Mansfield Town) wins a free kick in the attacking half. Second yellow card to Ryan Tafazolli (Mansfield Town). Joe Ironside (Hartlepool United) wins a free kick in the attacking half.